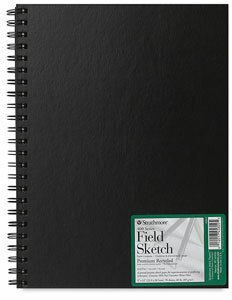 This sketch book is great for on-location studies with pencil, in classroom demonstrations, or studio notes. It has a spiral, hardbound leather-like cover that provides a steady surface to work on and sturdy wire construction that allows the book to lie flat. Inside, the book contains 70 sheets of 400 Series acid-free, recycled sketch paper.